Types of Precipitation is a five color, block print picture book which includes music and a compact disc. The old–fashioned illustrations are reminiscent of picture books from the 1950 – 1960’s. Types of Precipitation has 24 pages and includes song lyrics, sheet music, a six word glossary, and some “Guided Reading Activities” at the end. Aimed at a younger audience (3–9 years of age) the primarily banjo Americana style music by Erik Kosikinen includes an engaging kids chorus. 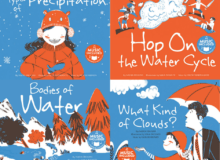 The story and song take readers through how precipitation forms and weather that comes when water droplets fall from the clouds in one of four forms: rain, snow, sleet, and hail. There is use of onomatopoeia throughout the story: flutter–glide, pitter–patter, plunkety–plunk, crash–bang, rat–a–tat. Types of Precipitation is a welcome and fun way for a young audience to learn about how rain, snow, sleet, and hail are formed. Stream the Water All Around Us songs now!